In the Western United States, few animals have a more fearsome reputation than the cougar. But at three weeks old, even the biggest big cat is really just a kitten. Known as P-46 and P-47, the two newest residents of Santa Monica Mountains National Recreation Area were recently implanted with tracking devices after researchers found their well-hidden den. "We only send one biologist to the den and take precautions on our scent," wrote a Park Service spokesperson on YouTube. "The purpose is to mark these kittens so that we can learn about them as part of our decade-long study to better understand how urbanization is affecting this very vulnerable population." One of the biggest threats to the area's mountain lions is genetic in nature: Increasingly isolated by human development, Southern California's cougars have become dangerously inbred. One proposed solution to the problem is the construction of wildlife crossings connecting different swaths of protected land. 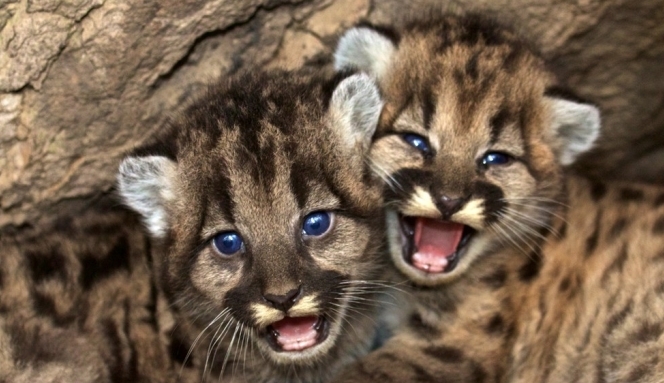 Responses to "Baby Mountain Lions Try Hard To Act Tough ... And End Up Looking Cuter"